Hybrid molecules containing β-carboline and 1-acetylpyrazoline moieties were obtained on the basis of the alkaloid harmine. The synthetic procedure included acetylation of harmine with acetyl chloride in the presence of tin(IV) chloride, Claisen–Schmidt condensation with benzaldehydes under basic conditions, and cyclization of the obtained chalcones by the action of hydrazine hydrate and acetic acid. In addition, a method was proposed for the preparation of 8-formylharmine by treating harmine with dichloromethoxymethane in the presence of tin(IV) chloride. The structures of the synthesized compounds were confirmed by NMR spectra, mass spectra, and X-ray structural analysis. This work was performed within the framework of grant project No. АР05135304 "Chemical studies of alkaloid-containing plants as promising sources of biologically active compounds” funded by the Science Committee of the Ministry of Education and Science of the Republic of Kazakhstan and with partial financial support from the Russian Science Foundation (grant 18-13-00361). The analytical and spectral characterization was performed in part at the Chemistry Collective Use Center of N. N. Vorozhtsov Novosibirsk Institute of Organic Chemistry, Siberian Branch of the Russian Academy of Sciences. (a) Turmukhambetov, A. Zh. ; Agedilova, M. T.; Nurmaganbetov, Zh. S.; Kazantsev, A. V.; Shults, E. E.; Shakirov, M. M.; Bagryanskaya, I. Yu. ; Adekenov, S. M. Chem. Nat. Compd. 2009, 45, 601. [Khim. Prirod. Soedin. 2009, 504.] (b) Nurmaganbetov, Zh. S.; Shultz, E. E.; Chernov, S. V.; Turmukhambetov, A. Zh. 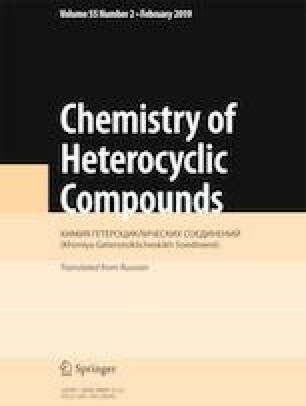 ; Seydakhmetova, R. B.; Shakirov, G. A.; Tolstikov, G. A.; Adekenov, S. M. Chem Heterocycl. Compd. 2011, 46, 1494. [Khim. Geterotsikl. Soedin. 2010, 1849.] (c) Nurmaganbetov, Zh. S.; Shultz, E. E.; Chernov, S. V.; Turmukhambetov, A. Zh. ; Seydakhmetova, R. B.; Shakirov, M. M.; Tolstikov, G. A.; Adekenov, S. M. ChemInform 2011, 42. DOI: https://doi.org/10.1002/chin.201139193.